Prof Morandotti’s group and his collaborators demonstrated the possibility of controlling the intrapulse Raman scattering by means of optical Airy pulses. 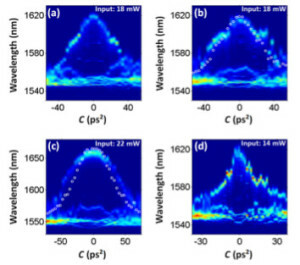 Figure: Experimental observations of the dependence of the Raman soliton self-frequency shift upon the linear prechirp coefficient C , obtained by using (a) a tail-leading and (b),(c) a tail-trailing Airy pulse, respectively, for different input powers. In (d), a Gaussian-like pulse is presented for comparison. The experiment published in Physical Review Letters has been performed using advanced pulse shaping methods. An optical pulse from a fiber laser successively passes through a wave shaper and an amplifier, while preserving the polarization and the average power of the pulse at the input of a 625 m long optic fiber. With this setup we were able to generate secondary Raman solitons through the interaction with tail trailing Airy beams. Additional experimental evidence shows that it is possible to tune the soliton’s energy. We envisage the possibility to generate and control multicolor Raman solitons, which could lead to a useful light source for fluorescence microscopy, on top of possible additional telecom applications. For example, two Raman solitons can be simultaneously obtained by using tail-trailing Airy pulses.